BLOW OFF SOME STEAM: Stress Relief for Today’s Steamfunkateer! The major contributing factor is stress. Negative stress, that is. Negative stress is highly destructive and can lead to permanent disability or death. Sadly, we do not understand stress and have thus trivialized it and placed the blame for our stress on others. How many times have you told someone (or they told you) “You’re stressing me out”, as if they have power of you? We control how we deal with stress and how we deal with it is linked to our personality types. I am revisiting this article I wrote on stress, as a much needed reminder to myself and, hopefully, you get something out of it as well. Many people skipped over this one when I first posted it. Please, don’t this time. It could help save your – or a loved one’s – life. Part-time staffers at Mount Vernon (WA.) 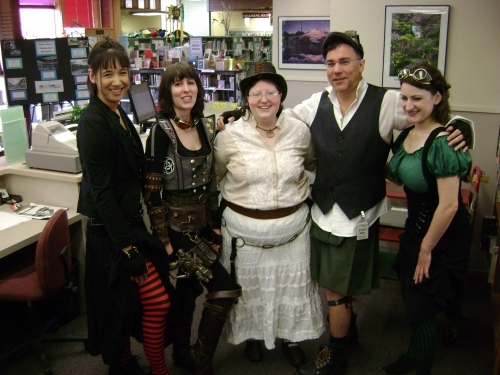 City Library­­ (from left) Charlene Patten, Alisa Kester, Bonnie Hood, Mike Bonacci, and Sara Bangs celebrate “Steampunk Friday” by wearing attire based on the science fiction genre April 23. According to library Director Brian Soneda, the dress-up day was designed to help staff members cope with the stress of a rough economy. I became highly intrigued and started thinking about how I deal with stress; how I teach my children and students to deal with it; and how tens of thousands of people use Steampunk daily, in various ways, to deal with stress. Stress can create feelings of conflict and/or anxiety within you. It can stem from demands you place on yourself or from external stimuli. If stress is not identified and resolved, it can progressively deteriorate your ability to function physically, mentally and emotionally. Negative stress – or distress – results in debilitating anxiety that affects your overall mental, emotional and physical health. From here onward, when we refer to stress, we are referring to negative stress, unless otherwise stated. Take a deep breath. Deep breathing helps calm the body. Watch your thoughts. Negative or fearful thoughts create more anxiety and stress. Thinking positive about a situation helps reduce stress. Practice visualization. Visualize what you want to happen in your life and affairs. Exercise Regularly. Physical activities often relieve the body of unnecessary tensions and allow the body to function more effectively. Exercise also provides needed diversions from life’s pressures. Learn to relax. Just a few minutes of peace and quiet each day to give one the ability to properly assess a challenging situation and to respond in an appropriate manner. Relaxation is a skill. Read something inspirational and listen to your favorite music. Talk about stress. Opening up about your problems or tensions with close friends, a therapist, co-workers or a clergy member will allow a sharing of feelings and an opportunity to keep potential stressors in proper perspective. Structure planning of daily activities. By properly planning and using one’s time wisely, daily demands can be handled before they create unhealthy stress. Daily planning provides for a varied schedule, which can include work, leisure, social and family activities, as well as personal time. Set realistic goals. People who expect too much of themselves are most frequently troubled by stress. Goals must be realistic to be motivational. Do some fun things. Treat yourself regularly by doing something that you enjoy. Get regular physical checkups. Often physicians can discover physical manifestations of stress that enable one to deal effectively with the tensions of stress. Seek more information about wholistic – non-organ specific healing methods that concentrate on the whole body – ways to handle stress and holistic – healing methods that concentrate on the physical, mental and spiritual aspects of life – ways to handle stress. How do you deal with stress? Each Personality Type has different stressors and copes in different ways. Better understanding of your own stressors and coping mechanisms can help you reduce the tension and anxiety stress often creates. Since Idealists tend to work for a better future for all, if things keep going badly and they lose hope, they become stressed. When Idealists experience great stress, they can have muscle or sensory problems. The Teacher is likely to become stressed if they experience an absence of trust and too much pressure to conform. They also dislike interpersonal conflict. If this happens, they may become excessively critical, which is antithetical to their normal positive self. One of the signs that the Teacher is in high stress is muscle tics or cramps. To recover, this normally social type must be left alone. Solitude and journal writing can help them get back to normal. Also getting out of the current arena of conflict and taking on a new project can restore their sense of self. The Counselor can become stressed when they are required to deal with too many unexpected events or required to be too extraverted for too long a time. They can get overwhelmed if they are required to continually do very detailed work. If this happens, their muscles tighten up and they begin to see the external world through suspicious lenses. To return to normal, they need time alone to recharge and a lightening of their usual schedule. It will not help if others give them advice. Stretching exercises and calm, solitary walks will help. The Champion is usually a bundle of energy, but they can become exhausted if they are overloaded with work. They also will experience stress if their values and principles are violated and they see others in their circle being hurt by policies that kill the human spirit. They will then become hypersensitive to what is going on around them. Facts become exaggerated. They have feelings of paranoia and may withdraw. To regain their equilibrium, meditation will help. Kindness and support by others, but not patronization, will help them get back to normal. The Healer is the most sensitive of all the Idealists to a negative environment. They notice problems in a group before anyone else. Divisions within a group can cause fear of impending loss. Also violation of their values can trigger stress. When stressed, they are likely to act out of character and take on behaviors that are not normally associated with them. They can seem to others as if they are splintered. Sometimes they will blame themselves, other times they will lash out at others. They may act precipitously or not act at all. To get back to normal, they need a lot of space and need to have their feelings validated. It doesn’t help to tell them that they are imagining things. It is important that the negative environment be dealt with by others or that the Healer is allowed to move to a more positive environment. When stressed, Guardians usually report being sick, tired, sad, or worried. The Supervisor, more than any other Guardian, tends to take on the largest amount of external authority, responsibility, and pressure. When they have overdone it, their only recourse to relieving these pressures is to become sick. No, they do not choose to become sick; it is simply their body’s response to the overload. They want to be recognized for their accomplishments and contributions. They want respect more than they wish to be liked. They will work harder and harder to earn this respect. They are drained by overly emotional responses to their directives. If disrespect continues for a long period, they may become hypersensitive to their feelings and that of others. To return to equilibrium, they need silent support from others, to cut back on responsibilities, and to practice healthy living by exercising and eating better. The Inspector is the most likely to complain of being tired. They have a greater need for private time than the Supervisor. They, too, will assume a great deal of responsibility. Their need to be exacting coupled with too many drains on their time can lead to their becoming stressed. They can become obsessed with details and criticize their friends, family, underlings or co-workers for imperfection. They can become fearful of anything that is not well-proven, tried-and-true. If they become impulsive or talk excessively about potential catastrophes, they are showing high stress. To return to equilibrium, their concerns need to be taken seriously by others and efforts need made to reduce their workload and give them more private time. The Provider is the most likely to first become angry, then sad and complain to anyone who will lend them an ear. This is quite different from their normal style of spreading happiness and making everyone around them comfortable. What triggers the stress is when others do not trust them or when they experience too much pressure to conform to a standard with which they do not agree. Interpersonal conflict with a family member, friend, boss, co-worker, or underling also takes a toll on the Provider’s equilibrium. When stressed, they may become excessively logical and critical in their dealings with others. To return to normal, they will need less pressure from others and more solitude. Sometimes writing in a journal will help them with their sadness. They may need coaching in how to deal with adversity and decrease their need for harmonious relationships. Changing the people they interface with may help. The Protector is the most likely to become excessively worried. Their highest skills come from preventing problems, and to do that one must think about what might go wrong and prevent it. But too great an overload can trigger excessive worry. Being forced to face too many new experiences can be daunting to the Protector and cause them to talk about potential catastrophes. They may experience a loss of control and even become impulsive while trying to fix all that they see going wrong. When others see them in this state, it is important to give them help and to lower their expectations about always being able to prevent every problem. Until they release some of their need for control, they will experience high stress. Rest, good nutrition, and treating themselves to peace and quiet will go a long way towards healing their stress. Since Artisans are usually optimistic and like taking risks, it takes a lot to get them stressed. But if they become severely stressed, Artisans can act out against others or themselves. The Promoter can become stressed if their options get closed off and they are forced to live or work in a very structured environment. Since their highest skill is being tactical in the here-and-now, excessive focus on the future will also stress them. Losing flexibility triggers internal confusion and thoughts of dire consequences. This can cause them to lash out at others and even take actions of revenge. To get back to normal they need to develop contingency plans and get help from others in setting priorities. The Crafter is the most freedom-loving of all of the Artisans. They can’t stand being fenced in or faced with high emotion. They generally are seen as the strong, silent type. If they don’t have the freedom to be alone and independent, they can become hypersensitive to relationships and can lash out in mean and sneaky ways. To get back to normal, they need physical and emotional space. It is especially important that others do not ask how they FEEL. The Performer loves fun and pleasure. Their love of life is attractive to others and at times they become the center of attention. If things around them become too constricted or too sour, it takes a toll on the Performer. They can become suspicious of others and even of themselves. Their unhappiness can seem overwhelming to them and in an effort to become happy, even temporarily, they can binge on food, alcohol, gambling or shopping. To recover they need to seek other avenues for happiness and need help from others in setting priorities. Phony reassurances will not work. Physical activity is needed to get them back in balance and away from the gloom and doom. The Composer is the most sensitive of all the Artisans to negativity and excessive criticism. Values conflicts are especially painful for them. Also threats of layoffs are harder on them than any of the other Artisans, provided that they like their job and the company. Instead of attacking outwardly, they turn the attacks on themselves and can act in such a way as to injure them. If others stop trying to reason with them, but simply validate their feelings, then leave them alone, the self-destroying thoughts will usually stop on their own. Since Rationals search for knowledge, competence, and eternal truths, when these needs are blocked, they become stressed. When Rationals experience great stress, they experience thoughts that tell them either that they must act or think in a particular way or that they must not act or think in a particular way. The outside observer sees the Rational as driven by compulsions or prohibitions. The Fieldmarshal is driven to lead. They want things to be logical, to be recognized for their accomplishments and to be respected for their visionary ideas. Sometimes they are forced to be harsh with others to accomplish their goals. If their harshness triggers high emotionalism and rumblings of disrespect from others, they can become hypersensitive to their own feelings and have outbursts of emotion. When high stress is triggered, they can become ritualistic in their behavior in an effort to control both the outside world and their inner emotions. It can help to talk to a trusted person whose counsel can help bring back balance. Also silent support from others along with the resolution of the crisis will restore equilibrium. The Mastermind sees situations from their own unique perspective and they enjoy finding new solutions to complex problems. They are driven to implement their ideas whether or not others can see their vision for improvement. If they are given no support, they dig in their heels and work all the harder to achieve their vision. Stress comes when they are forced to deal with too many unexpected events or if they are forced to be too extraverted for too long. The stress manifests itself by obsessive thoughts on external data and feelings of the world being against them. They can recover if they are given time to be alone, get their tasks rebalanced and have time to pursue their visionary solutions. It’s best if others do not try to give them advice or suggestions. The Inventor is always imagining something new and bounces their ideas off willing listeners. They are usually very positive and often laugh off anything negative. But if excessive negativity comes their way and/or they become physically exhausted, their fluid imagination works overtime and they obsess about problems. They can withdraw and sleep a lot while their mind deals with the issues. In the worst cases, they can become phobic and lose their friendly social abilities. It is best if they can walk away from their problems for awhile and let their brain rest. Meditation often helps. Quiet support from others for their physical needs also helps. The Architect prides themselves on their objectivity and ability to impartially analyze and organize thoughts. They enjoy tough critiques that help them to hone the exactitude of their thoughts. What they don’t like is strong emotional expression directed at them and being denied the alone time that they need. If this goes on too long, they become highly stressed and may emphasize their logical thinking to the extreme. They become overly sensitive to relationships with others and can lash out emotionally. To achieve their normal state again, they need to be left alone and not asked about their feelings. They also need reduced responsibilities until they recover. In today’s fast-paced world, we are faced with more stressors than ever before. We must cope with divorce, negative environmental conditions, substance abuse, a global recession and war. Stress is inevitable, so we must acquire the resources and skills necessary to cope effectively with it. The dressing up…the escapism…the criticism of dysconcious racism in the Steampunk movement…these are all forms of “blowing off steam”. They are all forms of stress relief. My suggestion is that we all discover the best ways to relieve our stress and how those ways can be expressed through Steampunk. Perhaps playing or game-mastering Steampunk role-playing games works for you. Maybe building a mechanical arm or making top-hats gives you relief from stress. Perhaps writing a blog, short story or novel is your form of meditation; or taking a workshop on indigenous African martial arts or Bartitsu. Find what works best for you and do it! Or, just get yourself a Steampunk Stress Reduction Machine. You will probably have to build it yourself though. The original one sold back in 2008. Posted by Balogun on May 19, 2012 in Dark Fantasy, Fantasy, Panel Discussion, Steampunk, Uncategorized, Writers Workshop and tagged balogun, black speculative fiction, harriet tubman, relief, steamfunk, steampunk, stress.